Jump-starting is dangerous if done incorrectly. So follow the procedure carefully. If you feel unsure about jump-starting, we strongly recommend that you have a competent service technician do the work. Precautions Carefully: To ensure safe and correct handling of the battery, read the following precautions carefully before using the battery or inspecting it. fl ames, including cigarettes, and sparks away from open battery cells: Flames and sparks near open battery cells are dangerous. Hydrogen gas, produced during normal battery operation, could ignite and cause the battery to explode. An exploding battery can cause serious burns and injuries. Do not jump-start a frozen battery or one with a low fl uid level: Jump-starting a frozen battery or one with a low fl uid level is dangerous. It may rupture or explode, causing serious injury. Connect the negative lead to a good ground point away from the battery: Connecting the end of the second jumper lead to the negative ( ) terminal of the discharged battery is dangerous. A spark could cause the gas around the battery to explode and injure someone. 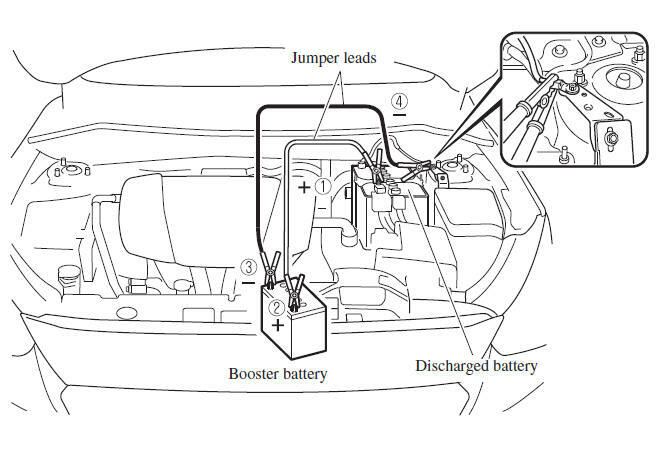 Route the jumper leads away from parts that will be moving: Connecting a jumper lead near or to moving parts (cooling fans, belts) is dangerous. The lead could get caught when the engine starts and cause serious injury. Use only a 12 V booster system. You can damage a 12 V starter, ignition system, and other electrical parts beyond repair with a 24 V power supply (two 12 V batteries in series or a 24 V motor generator set). Make sure the booster battery is 12 V and that its negative terminal is grounded. If the booster battery is in another vehicle, do not allow both vehicles to touch. Turn off the engine of the vehicle with the booster battery and all unnecessary electrical loads in both vehicles. Connect the jumper leads in the exact sequence as in the illustration. Connect one end of a lead to the positive terminal on the discharged battery (1). Attach the other end to the positive terminal on the booster battery (2). Connect one end of the other lead to the negative terminal of the booster battery (3). Connect the other end to the ground point indicated in the illustration away from the discharged battery (4). Start the engine of the booster vehicle and run it a few minutes. Then start the engine of the other vehicle. When fi nished, carefully disconnect the leads in the reverse order described in the illustration. If the battery cover has been removed, install it in the reverse order of removal. Verify that the covers are securely installed.